I've come across a Young Adult writer - Jessica George - whose book intrigued me. I admit I'm not a huge YA reader because there are too many trends that beleaguer the genre that make me stay away for the most part. So it's refreshing that her book does not have instant-love or is set in some dystopia, and that some real YA issues are actually featured. (Of course, Jessica and I also share a love for chocolate but that's another story). Without further ado, let's welcome Jessica! Tell us about yourself in three sentences? My name is Jessica George, but my author name is J.A. George. I was born in London, England and that’s where my family home is based. Right now, I’m living in Sheffield for my studies. I tell people it is a contemporary YA fantasy, but floating around inside, you can find small bits of romance, adventure, mystery and why not, comedy too. How did you choose what genre to write in? I started off writing GIFTED because I wanted something to read. I wanted to read a contemporary YA fantasy novel that didn’t feature instant-love, a chosen one or a girl growing up in a dystopian society. I just wanted to read about someone normal, someone I could relate to. Someone who worries about the way she looks, but never says it out loud, has a sense of humour, thinks about the small stuff. Then I wanted to take her and place her in a world she never thought existed. I wanted to explore real young adult relationships, friendships and modern-day topics such as, body weight issues and cheating in relationships. Okay, GIFTED is a lot less sombre than it sounds, I promise! Purple flowers, notebooks, and some books I am studying. I read. I eat chocolate. I bake. Not necessarily in that order! I also enjoy going out with my friends, especially out to eat or to the cinema. People. In a very small nutshell, Gifted is about a group of ordinary young adults with extra-ordinary gifts. We are all ordinary people with extra-ordinary gifts. Some of our gifts might just not be supernatural! Boil GIFTED down for us. 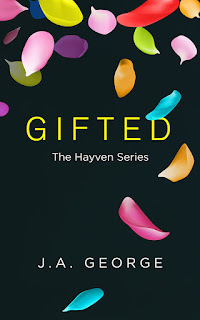 Alright, boiled down, GIFTED is all about a nineteen year old university student who meets a woman a little on the strange side, and then meets a young man a little more on the stranger side. These meetings lead to the eventual discovery of Hayven – a city separated from the rest of the world where only those with gifts can go. She makes an eclectic bunch of friends, who, even though I’m biased, are pretty awesome. But Hayven has its dark side, and they’re called Cliders. Gifters turned rogue, Cliders are determined to see the golden city of Hayven return to the way it was one thousand years ago when the city was under the dominion of Madrina. Want to know more about her? You’ll have to read GIFTED. Some of my favourite books. The biggest challenge you’ve faced writing Gifted? This published version of GIFTED is my second edition and in my first edition Avery was completely different. In the past, I’ve had problems with writing for other people. All authors want their books to sell and in order to do that, you have to write a book readers will want to buy. The annoying thing is, authors don’t know exactly what readers want. We may know a few things, but not all. In my first edition of GIFTED, I tried to write a novel that would make everyone happy, until I realised that that was impossible. So after two years, I randomly made the decision to write for myself. I am in serious danger of going off on a tangent, but I’ll soon be putting up a post on my blog all about writing for myself. Long story short, Ava was a bit boring, in my opinion, because I was trying to follow trends I’d seen before, trying to fit her into too many different boxes. Now, I just love her. She makes me laugh − a lot. I hope she’ll make you laugh too. I just wanted to live my life being able to say, “I don’t work”. I don’t ever want to see my life defined by “work” and for me, writing isn’t “work,” it’s too enjoyable for that. You know what they say, do what you love and you’ll never work a day in your life. Why should readers choose to read your book? I wouldn’t force my book on anyone, and I would never claim to have written the next best-seller. If you like contemporary YA fantasy centred on an ordinary young woman with a penchant for dry humour, try Gifted. The best I can say is read a sample here and make your mind up from there. J.A. George is the author of the four part series, GIFTED - THE HAYVEN SERIES. She spent years of her life reading book after book before sitting on her bed one morning, opening her laptop and typing Chapter One into a Word document. Now, not only does she read book after book, she writes book after book too. Usually with a large bar of chocolate by her side. Jessica is giving away two copies of her book! 1 paperback goes to anyone in the UK/US and 1 ebook (PDF or mobi) goes to anyone in the world! Synopsis of Gifted by J.A. George: There is no chosen one in this story. Avery Gray was just in the wrong place at the wrong time and happened to make a decision that altered her future forever. It happens to all of us every day.